For use with the A-Team Fury MkII. Some elements of Charles' original skin have been retained. 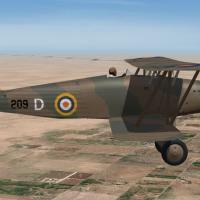 The Hawker Fury was still in service with the South African Air Force at the start of WWII. Due to aircraft shortages, the Fury was used in mixed squadrons during 1940 in East Africa. As it was too slow to catch the more modern Italian aircraft, the Fury was mainly used in the close support role.